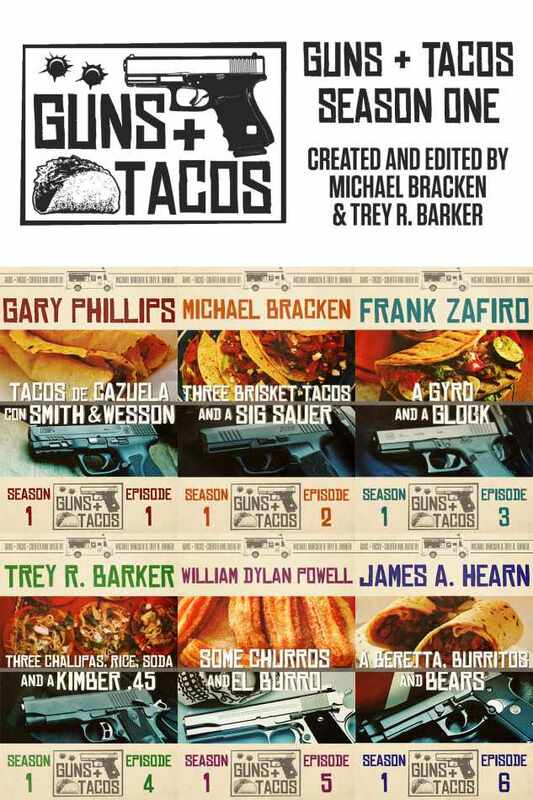 TAMPA, Fla. - March 13, 2019 - PRLog -- Down & Out Books is thrilled to announce that in July 2019 GUNS + TACOS: SEASON ONE will premiere. Created and edited by Michael Bracken and Trey R. Barker, the series will consist of six episodes published monthly, with each written to be enjoyed in a single sitting. "At Bouchercon 2018 in St. Petersburg, I spent a great deal of time hanging out with a revolving group of editors and writers affiliated with Down & Out Books," said Bracken. "Over the course of the convention, a joke Trey and I shared developed into the genesis of an idea for a series. Frank Zafiro and other writers made suggestions that expanded the scope into something Eric Campbell, publisher of Down & Out Books, liked so much he asked for a formal proposal." "I'm a huge fan of television and streaming crime serials, especially those that have an overarching theme but with single episodes that are self-contained," said Campbell. "Applying this concept to books is a natural extension of this interest. I was so excited by the outline Michael and Trey shared with me for Guns + Tacos that I immediately put the project on our production calendar." Here's how Bracken and Barker describe the series. "There's a taco truck in Chicago known among a certain segment of the population for its daily specials. Late at night and during the wee hours of the morning, it isn't the food selection that attracts customers, it's the illegal weapons available with the special order. Each episode of Guns + Tacos features the story of one Chicagoland resident who visits the taco truck seeking a solution to life's problems, a solution that always comes in a to-go bag." Two subscription options are now available on the Down & Out Books website. • A digital subscription, which entitles you to receive all six episodes before their official publication date plus the exclusive short story. We look forward to having readers join us on this new adventure. For more information about subscribing, visit the Down & Out Books website (https://downandoutbooks.com/) or contact us at info@downandoutbooks.com.